Attacked by my ex! Have you been the victim of violence from a partner or lover? Share your story and warn others. Simply fill out the form on this page, telling us a little about your story. One of our team will get straight back to you with a valuation of how much we can pay you to share your story. There is no obligation. We won’t use anything without your permission. Recent client story | Attacked by my ex boyfriend. This the moment a mother was battered to the floor by her yob ex-boyfriend. Then he dragged her lifeless body along a road. James Davies, 28, was jailed for 18 months for the sickening public attack on then-partner Charlie Davies, 24. Police released a short CCTV clip of the ordeal. But brave Charlie has now released the full three-minute video of the sustained beating. The video was given to her by police. It shows callous Davies carrying her lifeless body onto the street – having repeatadly punched her in the face after accusing her of “mugging me off” off camera. The yob then throws her to the ground, punches her repeatedly around the face, before dragging her into the road and sauntering off. But after less than a minute he skips back and drags her around 100 yards to their home – passing an astonished elderly couple who look on in horror. Charlie has revealed her identity for the first time and alleged he downed 15 pints before beating her after falsely accusing her of cheating on him. She said: “When I saw the footage I just felt sick. “It looked like he was dragging a dead body. It was like he was dragging a piece of carpet. “I don’t know how he could do that to anyone – let alone me. The pair had been going out for a year and were out to celebrate their first anniversary for a curry when they parked up near home in October last year. Charlie claims Davies had drunk around 15 pints of lager and some mixer drinks when they started arguing about his suspicions she was going to dump him. She claims she got out to leave and go to her mum’s home when he punched her “full pelt in the face about ten times”. She added: “He kicked me to my body and head and I was on the floor crying my eyes out. “He dragged my by my hair and started carrying me – that’s when the video starts on the CCTV. “He chucked me on the floor and kept attacking me and kept saying ‘you mugged me off so I’m going to mug you off’. “I was in and out of consciousness. I could hear him shouting at people who saw us. Charlie believe she must have managed to escape because when police arrived – having been called by shocked onlookers – she was laying outside crying. She was taken to hospital but miraculously didn’t suffer any broken bones and was left with two black eyes and extensive bruising and graze marks to her body. 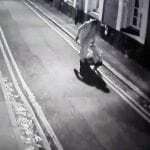 The CCTV of the attack was shown to Charlie – but only a short clip was released because Davies pleaded guilty to causing actual bodily harm. She has released the full clip in a bid to move on with her life and added: “He wrote his mum a letter which she showed to me saying he hoped we could still be together when he gets out. Catherine Donnelly, defending Davies at Maidstone Crown Court at his sentencing in December, said he had a problem with drink. Judge Charles Macdonald QC said the context of the offence was a stormy relationship where some force was used in the past “in both directions”. He added: “It was a single, though disgraceful piece of violence. You had an argument with your former partner in the car. Both of you had been drinking. “It turned to violence when something she said provoked you. You grabbed her hair. When out of the car you punched her to the face and head a number of times. “She was vulnerable because of intoxication. “It was a very sustained attack. It is also a case where the intention was to do more harm than actually occurred. Det Cons Phil Pead of Kent Police praised Charlie and added: “I would like to pay tribute to her for the courage she has displayed throughout. Including her wanting footage of the incident to be made public. “I hope it sends a clear message to other victims of domestic abuse that there is no excuse for such violence and that you do not need to suffer in silence. If you have a story similar to ‘Attacked by my ex!’ please get in touch and let us know. We help hundreds of people share their domestic violence stories every year. You can help others in a similar situation, and raise money for yourself or a charity. Fill out the Story Valuation Form on this page and one of our friendly, trained writers will get back to you if your story is suitable.